Rob has always considered himself to be the athletic type and loved playing sports growing up. He started playing basketball at the age of five and still plays today, but not as much as he plays and coaches volleyball. About twenty years ago Rob was first introduced to the game of volleyball by his good friend and the Director of Player Development for Aftershock, Rich Schwarz. Since being introduced to the sport of volleyball, Rob has played in several adult leagues. When he is not playing in adult leagues, Rob enjoys gathering his friends together to play, simply because he enjoys the sport so much. During the Summer Rob likes to take his stepdaughter, who is an Aftershock player, to play on the outdoor grass courts at Rincon Valley Community Park. Rob quickly turned his love of the game into more than just a recreational activity and began coaching. 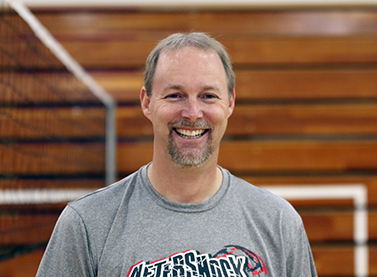 In 2009 Rob joined the coaching staff at Aftershock Volleyball Club and has coached with the 12 and under and 16 and under divisions. Recently, he applied to be the Junior Varsity Volleyball Coach at Santa Rosa High School and was successful in the process. As a volleyball coach Rob says he continues to learn the game of volleyball and loves to pass on this knowledge to the youths that he coaches.